To hear Dr. Jayashree chant the Yoga Sutras in Sanskrit is to be transported to the time whet this great text was transmitted in the oral tradition. Her melodious voice, flawless pronunciation and classical articulation of the Sanskrit, replete with meaning and the yogic vibration, is special to experience for oneself. In this interview, she explains her own fascination with the Sutras and why they continue to speak to seekers in every generation and culture, even beyond the shores of India, from whence they came. Integral Yoga Magazine (IYM): What are the benefits of chanting the Yoga Sutras? M.A. Jayashree (MAJ): Chanting the Yoga Sutras has a two-fold benefit. Once you have begun studying the Yoga Sutras, memorization helps in recalling the appropriate sutra in times of doubt—whether you have a doubt about your own experience or you are down because your Ashtanga practice is not progressing well. The repeated browsing mentally of the sutras’ ambiance (manana), in a certain state of mental quietude, will help in getting a flash of the real meaning and also produce the “Aha” experience—perhaps we can call it a three-dimensional understanding. Chanting and memorizing is vital for our knowledge to become wisdom. Whatever texts you study, chanting reveals itself to you in time. It is a kind of tapas, where we brig the physical mind, the rational mind and the emotional mind to a single point. There, not just understanding, but revelation, happens! IYM: What is special about Sanskrit as a vibrational language and chanting the Yoga Sutras aloud? MAJ: In India, the ancient seers were not satisfied to have a language that was just a means of communication for day-to-day activities. They wanted a language that could touch and transform the sprit too. For this purpose they created an oral tradition called the Srutiparampara, wherein a strictly prescribed way of listening and pronouncing the sounds, syllables, combination of syllables, words, sentences, passages and the complete sets of knowledge systems enabled the transfer from the teacher to the pupil without distortions. The Vedic seers were also interested in chanting as the basic means of modifying the spirit, so they perfected the language, namely Sanskrit. The perfection of a language, along with the methods of rendering, leads to the effective means of communication of knowledge at the rational level and also an attempt for a subtle transformation of the spirit at the deeper emotional and spiritual level. This was achieved by the wise combination of the sound value, the rhythm and the tune associated with the learning of the texts. This transformation has been so effective, even after five thousand years, it can be felt by those who chant, which makes superfluous the knowledge of the language to understand the meaning of the text! Chanting aloud helps in clearing the voice and lungs, and it helps you to listen to your own voice. Repeating the same word sequence helps the mind to remember the text easily. The mind has a fantastic capability to remember the sequence of words and sentences even without knowing their meaning. This builds a link between different cells in the brain. In this age of visual predominance, this practice hones the listening skills tremendously. It brings total attention in listening. It brings perfection in pronouncing the text. It utilizes all the vocal organs, improves memory and works to extend the breath fully, leading to pranayama and a deep, meditative state. Just the sequence and combination of syllables and the vibrations produced transforms the personality. IYM: If someone wants to study the Yoga Sutras, what is the best way to start? MAJ: There are three levels in the methodology of the study of the Yoga Sutras. The first is the regular practice of Ashtanga Yoga, as mentioned by Patanjali, which includes the practice of yamas and niyamas, the most vital part of the journey for emancipation and liberation. Patanjali says that Yoga has to be practiced without interruption, for a long time and with a firm, positive faith that the practice will get the results. The next two levels address how we gain this firm faith in our practice. Level Two involves the memorization of the Yoga Sutras through chanting, whereby a deeper understanding of the blueprint of the journey to be undertaken to reach liberation, or kaivalya will occur. Thirdly, the repeated chanting done religiously helps in catalyzing the process of evolution, with knowledge being replaced with revelation. IYM: What is Maharishi Patanjali’s main message? MAJ: It’s to show how humanity, with a voluntary practice, liberates itself from all the miseries of the world and evolves to the highest state of consciousness—an eternal state of bliss and awareness. This can be had, not by an external journey but by an internal journey. According to Patanjali, you are an abode of the divine whose expression is unalloyed bliss…. IYM: What do the Yoga Sutras have to offer to the world? MAJ: We in India feel that human beings have become victims of our own creation, riding on a tiger’s back, and we are tired of the ride. The human quest to find solutions to all our problems through science and technology alone, has resulted in this mythical tiger and the feeling is that we are being led rather than being in the lead. So humanity is in search of mental and emotional security, which can only be gained by an internal journey and not by acquiring more knowledge or instruments to make one feel more secure. Technology can help in making us secure from external onslaughts but how can we become secure from internal onslaughts? That is where Patanjali scores. He gives a practical plan to create internal securities, too. His system is universal. If studied properly, understanding the Indian ambiance behind the Yoga Sutras, it would provide an excellent text to the psychologists of the world, offering a simpler and better method to liberate humankind from its imagined insecurity. It also helps humanity to realize that happiness is an inner state, which releases it from its obsessive fixation towards objects as sources of happiness. IYM: Why have the Yoga Sutras become so meaningful to you? MAJ: I was raised in a very orthodox family that, for centuries, specialized in Indian texts of Vedanta. Even though I had the understanding of the purport of the Yoga Sutras, it was only due to my interaction with students who are practitioners of asana, pranayama and, to some extent, dhyana, that I came to realize the depth of the meaning of the Sutras. The questioning attitude of the non-Indian yogis also made me explore the inner and subtler shades of meaning at different levels, which we Sanskritists normally never do. After teaching the chanting of the Yoga Sutras for more than a decade, I have realized that this constant chanting, day in and day out, has transformed me physically, mentally, as well as emotionally. It has made me a firm believer that chanting is really one of the catalysts in attaining liberation. A deeper understand of the Yoga Sutras has helped me become more of a witness to what is happening around me. This has led to greater strength in confronting unforeseen situations with equanimity and poise, without becoming emotionally lost in the situation. I laugh more than ever. My compassion circuit is becoming more and more active and helps me in taking the appropriate action that the situation warrants. Dr. M.A. 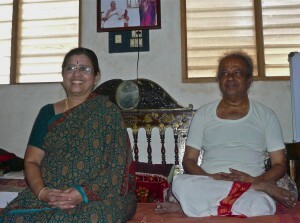 Jayashree was head of the Department of Sanskrit at D. Banumaiah’s College in Mysore, India. She has authored many books in the fields of Sanskrit, ancient sciences, Indian history, culture and music. An accomplished teacher of spoken Sanskrit, Dr. Jayashree has a large following of overseas students. She is the voice heard chanting the Yoga Sutras in the documentary, Living Yoga: The life and teachings of Swami Satchidananda. ♦ Jayashree’s beautiful recordings of the Yoga Sutras, as well as several Shanti Mantras, can be downloaded here for a small donation. In addition to the Yoga Sutras, key texts of Ashtanga Vinyasa Yoga include the Hathayogapradipika and the Bhagavad Gita. Jayashree’s comments here highlight two of the most obvious differences I’ve noted between my own and my Indian teachers’ intellectual styles. 1. My Indian teachers are all very comfortable with paradox. Ethical and moral faults agitate them, but conceptual contradictions do not. Indian philosophy is capacious, containing all sorts of contradictions (and dissolutions of seeming opposites). Westerners run in to one such apparent clash when we do our “compare and contrast” thing on two foundational yoga texts: the Yoga Sutras and the Hathayogapradipika. The first offers what Narasimhan calls a “mentalist” approach to yoga, whereas the second is tantric, approaching yoga through an embrace of all that is right here, embodied and immanent. So what? As Pattabhi Jois would say, “do your practice and all is coming.” I interpret this “all” to entail a resolution of the clever, shallow analytical problems I manufacture with the aid of an undergrad philosophy degree and a penchant for logic texts. 2. The way the yoga tradition views “how people know things” or “where truth comes from” (i.e., yoga’s epistemology) goes way beyond rationality and controlled experiment/ data gathering, which are the standard truth-avenues of western science. Jayashree’s comments on revelation point to a kind of “empiricism” that goes beyond getting some data that refer to an external world. This sense of “how you really know” points to flashes of *getting it*. Talk of the “Aha” is a way of raising a verbal eyebrow, suggesting a knowingness that is not deductive, inductive, or measurable. This is an epistemology that moves toward (and derives from) revelation: to and from personal knowledge that cannot be conceptualized with language at all. Or so it seems, when I watch Narasimhan’s eyes dance as he contemplates answering my dumb questions about dhyana and samadhi. I tried a few years ago to get a chanting group together to get into pada 2. One of our mutual friends from S. America showed and we went at it – the first 5 slokas of Pada 2 – for about an hour. It was great. We never met again. I recall a quote I noted from our teacher RF who stated “the art of living is letting paradox be”; it rings truer and truer the older I get. I came from a scientific epistemology that to me says “all things are capable of being explained”. It is a deep samskara for me and keeps me searching when I might me better off moving into a “knowingness that is not deductive, inductive, or measurable”. Yet, somehow it must be….and its not. Or perhaps its Snot – just the residue of a lot of huffing and puffing and cogitating that finds its way out of the orifices at moments embarrassing and all too human. Great comments. Thanks for that. Here is Jayashree’s written description of Srutiparampara – of the oral tradition by which yoga is taught. Srutiparampara dates back to Vedic period and has a tradition of approximately 5000 years. It evolved as the best means of preserving and transferring knowledge acquired by Sages and Scholars. Sruti means listening and Smrti means memorizing. The Guru (Teacher) used to recite and the Sisya (Student) used to listen, repeat twice or thrice and then store it in his memory. Then propagate the so acquired knowledge to an aspirant through this system. Indian tradition is an oral tradition of passing the knowledge from Guru to Sisya through generations. Even today the Sastras, Music and the fine arts are taught in a traditional environment in the above system. Yoga Sutrani of Maharsi Patanjali. Back matter of booklet to accompany audio recordings.